Dr. Seldin is known as the ‘‘intellectual father’’ of UT Southwestern Medical Center. The institution’s faculty has received six Nobel Prizes. WASHINGTON — When Dr. Donald W. Seldin arrived in Dallas for the first time, in January 1951, he asked a gas station attendant for directions to the country’s newest medical school. Dr. Seldin, a Yale University graduate and retired Army doctor, had just accepted an appointment at what was then Southwestern Medical School, part of the University of Texas system. He had never seen the school, and when he followed the attendant’s directions, he found only converted, dilapidated military barracks, an old brick building, and a pile of garbage. Dr. Seldin had already given up his youthful love of poetry for the more lucrative career of medicine and now realized he had traded a faculty position at Yale for what appeared to be a broken-down, backwater posting in internal medicine. Yet despite the pocked floors, busted windows, and dispirited faculty — all of his fellow physicians deserted him within a year — Dr. Seldin remained at the school and, as chairman of internal medicine from 1952 to 1988, built it into one of the country’s premier research institutions. Dr. Seldin died April 25 at his home in Dallas, said his wife, Ellen Taylor Seldin. He was 97 and had lymphoma. Now known as UT Southwestern Medical Center, it is home to a medical culture acclaimed for its combination of academic rigor and humane caregiving, and the faculty has received six Nobel Prizes. 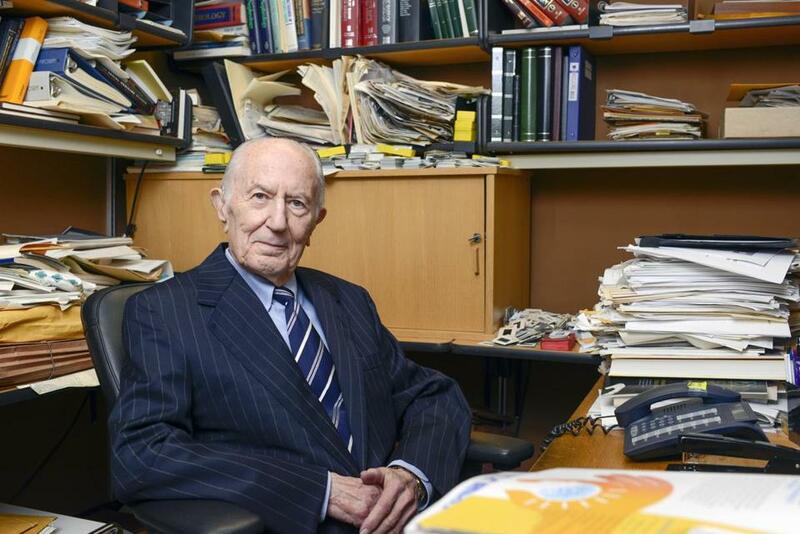 Dr. Seldin, known as the institution’s ‘‘intellectual father,’’ ‘‘created a vision of medicine that was based on science, and he brought it to fruition,’’ said one of those Nobel laureates, geneticist Michael Brown. His innovations included an approach to medicine that placed an equal emphasis on medical research, teaching, and the treatment of patients — a tripartite method that ‘‘wasn’t obvious to a lot of people at the time,’’ Braunwald said. As a physician-scientist, Dr. Seldin helped establish the kidney-focused specialty of nephrology and with Yale physiologist Gerhard Giebisch coauthored one of the earliest authoritative textbooks on the subject. But he spent much of his time outside the lab, assembling a team of world-class physicians and researchers from scratch. Establishing the medical equivalent of a farm system, he encouraged ambitious young students — many of them ‘‘West Texas farm boys,’’ Dr. Seldin observed — to enter the academy rather than run off to private practice. Upon graduation, he sent his wards to the National Institutes of Health or to more established universities for additional training, with the promise that if they returned in a few years, they’d have senior positions on the faculty. Dr. Seldin urged one student, Joseph Goldstein, to study genetics rather than neurosurgery and, according to Texas Monthly, told him he could run the school’s genetics division if he returned in six years. When Goldstein came back, Dr. Seldin helped woo Brown to join him as well, laying the groundwork for a research partnership that resulted in the school’s first Nobel Prize for medicine or physiology. The duo shared the honor in 1985, for their work on cholesterol metabolism and the treatment of heart attacks and cholesterol-related diseases. A decade later, after Nobels were received by biochemist Johann Deisenhofer in 1988 and pharmacologist Alfred Gilman in 1994, UT Southwestern boasted more Nobel laureate faculty members than any medical school in the world. Dr. Seldin was not alone in establishing UT Southwestern as a first-rate institution. His decision to remain in Dallas, rather than bolt for one of the coasts, was greatly influenced by the hiring of George Aagaard, who served as dean at the same time funding was furnished to replace the school’s shacks with a proper building in the mid-1950s. Two decades later, Dr. Seldin joined with Charles Sprague, the school’s newly appointed president, to expand UT Southwestern into a full-fledged research institution. As chairman of the school’s internal medicine department — and even as chairman emeritus, the title he held until his death — Dr. Seldin was the singular embodiment of UT Southwestern’s culture of discipline and ambition, known for sleeping just four hours each night and performing his rounds well past midnight. Donald Wayne Seldin was born in Brooklyn’s Coney Island neighborhood on Oct. 24, 1920. He graduated from high school at 16 and studied the humanities at New York University, until he decided literature and philosophy ‘‘would lead nowhere’’ and switched to medicine. Dr. Seldin graduated from the Yale School of Medicine in 1943 and that same year married Muriel Goldberg. She died in 1994, and four years later, he married Ellen Lee Taylor, a former student who practices emergency medicine in Dallas. While serving in the Army in the aftermath of World War II, Dr. Seldin testified as an expert witness in the trial of a Nazi doctor, a man accused of murdering about 40 people through experimental liver biopsies at the Dachau concentration camp in Germany. The doctor was convicted and sentenced to death. In addition to his wife, he leaves three children from his first marriage, Leslie Lynn Seldin and Donna Seldin Janis, both of Manhattan, and Donald C. Seldin of Houston; and two grandchildren.